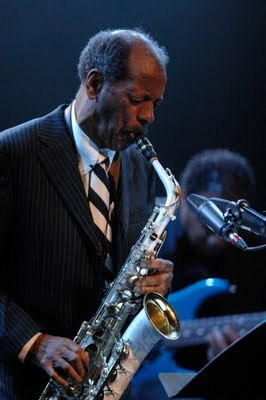 Ornette Coleman in Montreal, 2009. Photo: Yves Alix. I interviewed Ornette Coleman over the phone in early June, 2009. He was leaving for Europe later in the day, and the interview was put off several times because Mr. Coleman was not completely prepared to go. Finally, at the last minute—I had an appointment of my own looming—his publicist called and said that Mr. Coleman would speak with me for twenty minutes. In the end, Mr. Coleman was very generous with his time, and the interview ran 28 minutes, until I could wait no longer to leave for my appointment. Mike Chamberlain: I understand you're getting ready to leave for Europe. Ornette Coleman: Yes, that's true. MC: Well, I'll just take a few of your minutes, if I can. OC: No, take your time. MC: I want to ask you a few things. Next month, you're playing in Montreal, and they're giving you the Miles Davis Award. I wonder what that means to you at this point. OC: Well, I think everybody wants everybody to be happy, so I think it's all for the same reason. MC: Can you explain that for me? OC: Well, the explanation is humans beings is all there is, but they recognize what knowledge can do and what it needs to do, and culture's one of the highest points of using knowledge as a form of freedom for what we call the human race. That's not too bad, is it? MC: Not too bad, not too bad. And I mean, what I should have said at the very beginning was to thank you for all the music that you've given us over the years, because it was not always easy for you, especially in the beginning, and you've followed your own path despite a lot of hardship along the way, and I think that that in itself is something to be applauded. OC: Well thank you very much, and if I had to do it over, I'd do it again. OC: Yes, because the idea is all there is. And everyone has an idea of their own. That's not too bad, it's just where it becomes detrimental to the knowledge of humans is when it gets going the wrong way. There's no reason for knowledge to become an enemy to anybody. MC: No, no. You came into the jazz world, such as it is, and I wonder about your relationship to the term jazz and how you feel about that word and how you feel about the jazz world, such as it is. OC: Well, when you ask me how I feel, it is obvious that feeling becomes everything that has to do with knowledge, and knowledge is the interpreter that makes us do and know and learn, it's educational. But the most knowledgeable thing that exists is the soul of human beings, and that is something that only what is known as God can identify what a soul is before it came into existence as human beings. And I'm not sitting here trying to describe what it is. I just know that language has words and words mean different things, and the word soul refers to human beings, doesn't it? Or does it. MC: I would hope so. OC: Yeah, me and you both. MC: [laugh] I hope we have souls. OC: [laugh] you and me too. That would be good if we could identify it in a way that we wouldn't have to worry about it. MC: Well that's true but it gets mixed up in a lot of different things I think, and the demands of the world are very harsh. OC: One other thing—it doesn't represent all the qualities that represent the human race. Soul and poverty, it's enjoying something that you don't have and look past that. I imagine you could be the richest person in the world and still be lonely, you know, so…. MC: Happiness doesn't necessarily come with money, that's for sure. OC: Oooh, you said it, you couldn't say it any clearer than that. MC: Has it made a difference to you, when you think of your days when you were really, really scuffling, in the 50s in Los Angeles compared to now, when, as I understand, life is more comfortable for you, at least materially. OC: I agree that confidence has done two things for me: It has aged me and it also has put me in lots of stress to survive. Not in a negative way, but in a way that we call knowledge, I mean, "what is your trade, and what do you do to make a living?" Everybody that's in the male species is built to represent what field you are in and what do you do to survive in the sense of what you have to do TO survive. Money is just a word, but love is the authority. It's just sad to realize that being human is like, I don't know, maybe a million years from today humans won't have to be by class, it'd be by soul. MC: That would be good. MC: I read this thing recently where you were talking about when you were first playing the saxophone, you picked it up and you thought, "OK, I'm just going to play the saxophone." And then when you started playing with other people, they told you that this wasn't good enough, that you needed more than that. And I like this idea of picking up an instrument, whatever it is, and just trying to be yourself on that instrument. OC: Yes, well I think that should be a human condition that everyone is able to investigate. It's not a rule. Basically it comes under the heading of what you learn, why you grew up to do things that people bring into the world by the fact of what we call civilization, knowledge, and intelligence. But those are classified things that make what we call the human race in a much higher form to survive. And if that wasn't the way it is, human beings wouldn't be so complete in openly sharing and doing. Maybe there are human beings who created themselves, but I haven't met one. And it's so obvious that the word human is at the service of anything that has to do with form. OC: There's mosquitoes, there's thrashers, but the human being came into existence above all of those things. But for some reason, I'm just saying this because I'm classified as a human and I am a human being, it doesn't necessarily make you any better or any worse—it just gives you a title. I mean, look at the word God. The name of God doesn't have to be put into any category. It's really amazing for the life that is life to be able to support the whole world, and all we end up doing is working, and getting old, and pass. But now life itself don't do that. It's still here while you're gone. MC: Life is pretty much indifferent to our individual existences. OC: Oooh, you said it. You said it in the most intelligent way. MC: But that's our fate as human beings. We struggle against the acceptance of these inevitabilities. OC: Ooohh, you couldn't have said it better. But don't we respond to life as being the creative guide? MC: I hope so, maybe the person such as yourself who is not only an artist with a very strong conception of what you want to do musically, but also somebody with a very strong—I don't even know whether to call it will, because I don't even know whether you look at it that way because you just do it because you need to do it—but the majority of people, and I would include myself among those people, often tend to go for the thing that is comfortable rather than the thing that is going to force us to struggle in certain ways. We want the certainty in our lives. OC: Yes. But the word human cannot be connected to the word animal. That's why, isn't it? I don't know about heaven on earth, but there's nothing in the way of human beings making heaven on earth something that has to do with the quality of humans. OC: Well, when is that going to happen? MC: We're not evolved enough yet. OC: What's that you say? MC: Maybe we're not evolved enough as a species. OC: Oh, right. But do you think we as a species is the right word? MC: Well, it's a word. OC: It is a word. MC: We are designated as humans, and under that classificatory system, species is the appropriate word. We might want to sit and discuss that for a while, I'm not sure. OC: But women seem to be more connected to humans because they actually grow humans inside of them. Men can't do that. He's on his knees. But what happens to the concept, what happens to life? Is life a word, does life exist? MC: Whoo, I don't know, man. I don't have a quick answer to that one. OC: I don't know neither, but I know what the word is supposed to represent—anything that moves, talks, and can see, and walk and talk, that's called life. But is it life? MC: Well, there's another thing, because every word can have a number of different meanings. OC: That's a matter of fact right. MC: And they've all got connotations. You know, I saw you perform last year in Burlington, Vermont. And I had a very interesting experience there. I took my seat and a couple sat down in the seats beside me. And the woman was sitting next to me, and the woman maybe was 65 or something like that, and she asked me who Ornette Coleman was, and I tried to explain, and she asked me: "Am I going to like it?" OC: [Laughs] Well, she asked a good question. MC: That's a good question, but there's no answer to it, of course. MC: And I said: "Well I don't know, I'm hoping I'm going to like it, and it would be really nice if you like it, but we'll just have to wait and see what happens, and I expect to enjoy this very much." So you played the set, and I thought it was very wonderful. And the word I use to describe the performance is human. It's not without its flaws, but it's perfectly human in the way it's done, I thought. OC: That's right. And imagine the word "human". What it means and what it represents doesn't necessarily tell you what kind and who and why. Nothing comes behind that. That's pretty heavy. And the thing about it, there are more people walking right who are called human than any other form of life. Now that's not too bad, but I don't know if the word human is causing humans to become enlightened, to be enlighted, by the quality of what we call God. Now God must be not only human but the only internal human. Because God only deals with the human being, doesn't he? MC: I don't know, that again is another topic for debate. OC: I know, but do you think there's any other form of life that God is interested in more than human? MC: More than?... No. No. OC: Me neither. But most everything I learned from God comes from humans. MC: But we're supposed to have been created in God's own image, in some way. OC: Yeah, but nobody has seen God's image. MC: That's true. And that's only what has been written in one particular book, so I'm not sure. MC: No, I'm not so sure about that. What about your approach to music making—has it changed over the years? I know your music has changed a bit, and you go through different stages, but your own internal approach, has that undergone any…..? OC: The only thing I can tell you what I think it is and what it should be and what it's not going to become. OC: Life. That's a very good description of the human race—call it life. I mean the human being is the closest form in the world that is called life. Because life allows the human beings to indulge in all forms of thought, emotion, and concepts, put it that way. But they made something in there called money that not everyone's entitled to, they have to do something for it. That's not so nice. Someone else is making something that you can't make, but you have to work to get what they're making, and they're not concerned about you. Now, what is that called? It's not a job. OC: Well, whatever it's called, it works like everything else. I mean, I'm not sitting here trying to put anything down because imagine, the word human only represents two forms. You have to have a form that basically looks the same when it sees another creature walking down the street. Right? The other is that you have to see the intelligence of the highest form of human. And it's obvious: the highest form of human is knowledge. Right? OC: Yes. But how does knowledge treat everybody fairly? It doesn't. OC: And it's not trying. You see, if you have something that's valuable, I want it so that I can make sure that you have to come back and relate to me to go to where you think I can take you. OC: I'm not a soul or human being that is trying to analyze the quality of life. I just know that I'm alive. And when I'm no longer alive, I won't be in existence. But that's true of everything, isn't it? OC: But that's not so good. MC: Well, that's the way it is, and it's in the difference between what should be and is that we all try to find our place. OC: But I don't think God dies. Does God die? MC: I don't think so. OC: Yeah, well, and God is not against you knowing what, how, when, where, and uh, what else…? OC: Yeah, now you said it. [laughs] You hit the nail on the head. "Why?" But now, is why only a quality of knowledge that doesn't mean what it means to everybody? If it does, we're in trouble. MC: Well, I think we're in trouble. OC: No, but the reason why I'm saying this is because I'm self-taught in everything I do, and I'm not bragging. I'm self-taught because I was raised by women, and they wasn't working to make me leave the house. They was staying in, and I was leaving the house. They knew then what knowledge meant. I'm learning what knowledge is and what it meant. But the real purpose of knowledge is human power. OC: Yes, human power. But it's not used to the same purpose by everybody. OC: And look at the word love. I mean love represents, I think, the male and the female. But human beings? You see animals responding to each other like male and female, but they can't go to the store and buy a package of whisky or whatever. MC: Well, we have language, obviously. OC: Yes, something I was missing. MC: But that's one thing you've used, "Sound Grammar" and "In All Languages" and so on, this notion of music as a communication of knowledge and feeling, an analogy to language in a lot of ways. OC: Yeah, what you're describing is that there are many forms of things that are used to raise the human being's concept of knowledge in relationship to what knowledge does for the person. But the real purpose is that—look at light, light is probably the most advanced thing that exists on Earth, and yet it's just being like any other tool. The gravity that makes light, heat's got a lot to do with it. I'm not an authority on anything. I'm just talking because I've lived so long to describe something that I call light, and I know that it's made out of heat. But the human being is neither made out of heat OR light. It's made out of flesh and blood. MC: We're mostly air, I think. OC: Ooooh, you said something. Mostly air? MC: In between the bits, you know. OC: Oooh, you said something there. Like breathing? MC: Well, just space, really. When you think about it, if you believe in atomic theory, we all consist of atomic particles, and those are mostly space in between the protons and neutrons and electrons. In that sense, it's kind of funny to think about it that way, because we all seem solid to one another. OC: But you can't read about the quality that we're talking about that represents the same equivalent to what the Bible is. How did that get so far away where it doesn't have to be analyzed? That's pretty weird. I mean here is the one thing that's describing something that's eternal, and all you can do is read about it, but you can't participate in it. MC: Well, I don't know…..
OC: I don't mean that you can't go to church and do your dues. I'm talking about what created the quality of what caused all that to come into existence. That's something else. MC: That's the mystery, you know. That's the thing that's behind everything we call the material world. The material world is just one thing, and the other stuff like you're talking about, that's something else, and we don't know the answers to those questions. OC: I know, but imagine, the only way that you die is if something kills you. I mean, of course, if you fall out of a 100-feet building and hit the ground, you're gonna die. But see, to kill is one thing, to live and die is another, but it's the same result. That's pretty weird. MC: But isn't the ideal thing to try to live and not to be dead while you're alive, you know what I'm saying? OC: Yeah, yeah, I understand. But it seems to me that you don't have to try to live. You've already been born with the substance that what made you be able to live. I don't know how it works, but it's definite: life doesn't have to get permission to exist. MC: Mr. Coleman, I don't have any more time myself right now, and I know you're running around, I appreciate your time very much. OC: Thank you very much. I enjoyed your conversation. MC: I look forward to seeing you in Montreal. OC: Thank you very much. MC: By the way, I want to tell you about the lady at the concert: she really enjoyed the concert. OC: Well, thank her for me. MC: I'll probably never see the woman again, but she really enjoyed the concert, and I want to thank you very much for all the music you've given us over the years. OC: Well, thank you. Do you play an instrument? MC: I wouldn't go so far as to say that I play an instrument. OC: You have an instrument? OC: Let me tell you this: three changes in Western culture that covers all the ideas that notes cherish—that's CMaj7, E flat minor 7, and D minor with a flatted 5th. So you have three chords with twelve different sounds. Now what you have to do is to create those sounds from your own emotions. You don't even have to think of the notes. You have to think of the notes you want to activate to make an idea. Don't think of the key or the melody, think of the notes. And you'll stay clear and know which one is relating to your own emotions. I know from experience. MC: Sir, I appreciate the information. OC: Well, tell me your name again. MC: My name is Mike Chamberlain. OC: Oh Mike, I've enjoyed speaking to you, and have a wonderful weekend. MC: You too, and maybe one day we'll get a chance to speak again. It would be my pleasure. In spite of Ornette Coleman's abstruse way of articulating his ideas, there is one thing worth noting, namely, his single-minded devotion to them. Apart from his idiosyncratic manner of expression, you can see in our conversation how he resists attempts to deflect him away from his train of thought or to change the subject. He is going to say what he needs to say, no matter what. That's what he's done in his music-making since Day One.